The winter conditions in the Lakes have been pretty good this year as well. Go Higher is a small, family-run mountaineering business based in England's spectacular Lake District. We have been offering climbing and outdoor adventure holidays and courses in Britain, Europe and other parts of the world since 1976. In 2001 we celebrated our 25th Anniversary of operation. Our friendly, professional team operate within a warm, family atmosphere. Each of us brings a lifetime's experience and commitment to a wide range of outdoor pursuits such as walking, rock climbing, abseiling, mountaineering, and many other activities. We pride ourselves on our personal touch, providing a safe, fun environment in which you can enjoy all that the outdoors has to offer. Our instructors are competent and patient, allowing you to go at your pace. We tend to be informal and flexible rather than adhering to rigid schedules; planning the day's activities around your tastes and other factors (such as the requirements of the activity, and the environmental and weather conditions). Jim and Ben on Grey Crags, high above Buttermere. Go Higher's Cumbrian-born Director, Jim Morgan, is a qualified member of the Association of Mountaineering Instructors (AMI), with more than 30 years' experience in mountaineering and climbing. 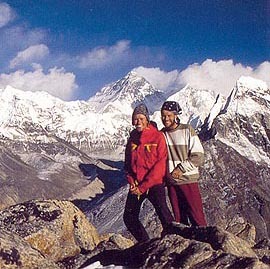 His personal mountain experience extends from the Canadian Rockies to the Alps and Himalayas. Our quality service provides adventure experiences in magnificent locations while teaching new skills and encouraging self-reliance and teamwork. While many of our clients rapidly develop their own skills and gain the freedom of the hills, we retain a loyal core of clients/friends, who return time and time again to enjoy our personal touch, love of adventure, and belts-and-braces approach to safety. Why not join us? Scrambling on Corvus, Raven Crag, Borrowdale. "Just a quick note to thank you very much for such an enormously successful holiday: I"m sure that you must have been able to perceive for yourself how much I enjoyed it and also how much I got out of it in terms of new experiences/challenges." "The trip felt, right from the start, much more like being on holiday with friends than being part of an organised group (!! ), and I very much appreciated the comfortable informality of the arrangements and the warmth with which you all welcomed me into your circle." Instruction: Courses in Abseiling; Canyoning and Ghyll Scrambling; Rock Climbing (Introductory, Intermediate and Classic Rock); Scrambling; Winter Mountaineering; Ice Climbing; Navigation; and Improvised Rescue Techniques. Jonny, Graham and Paul heading into Wasdale from Great Gable. Shared (non-exclusive) Guiding: If course dates are unsuitable, or if you have specific requirements and don't mind sharing your experience with other people, Go Higher provides shared (non-exclusive) guiding at competitive rates in all disciplines throughout the year. Private (exclusive) Guiding: Go Higher also excel in the provision of private (exclusive) mountain guide services to individuals and private parties. Group Activities: We organise customised instruction and multi-activity programmes for groups, including abseiling, corporate training and school groups. For the complete list of our current offerings, please see our Tariff and Calendar of Events. To make a booking, please feel free to use the booking form provided on this site. Alternatively, you can contact us directly at High Dyon Side by phone, fax, mail or email. If you'd like to be kept informed of our activities and offerings, please join our mailing list. Whilst specific provisions vary between activities, in general we provide all the technical equipment you will need to take part in our activities, such as ropes, climbing harnesses, safety helmets etc. For detailed information on what you will need, refer to the page which describes that particular activity. Go Higher's base, High Dyon Side, is a large, comfortable farmhouse surrounded by beautiful woodland gardens. We offer single and twin bedded rooms with bed & breakfast, or dinner + bed & breakfast. We can also assist you in arranging other accommodation if preferred, or you can do this yourself through the Cumbria Tourist Board. See also our links to other accommodation resources in the Lake District. There are dangers in all mountaineering activities. Our aim is to minimise the risks and help you enjoy the mountains as safely as possible. Go Higher carries professional liability insurance. We recommend that you also take out adequate personal insurance against cancellation, accident, loss of equipment, etc. In the case of overseas holidays this should include rescue and recovery insurance. Photo Sharing: we are playing around with the idea of sharing photos via the flickr web site; please try to join the group and upload any photos. Let us know how it works out! Go Higher Classic Climbs - a list of many of our favourite routes in Cumbria and the Lake District to whet your appetite and fuel a few discussions in the bar. 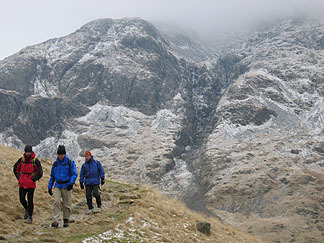 Throughout the season we will be climbing, fell walking, scrambling throughout the Lake District as usual. I hope you can join us. The winter climbing conditions have been excellent. Please have a browse of the site and let us know what you think. Andrew and Graham on Nameless Tower (5,600m) with Mt. Everest behind, Nepal. Here you can find out about all the exciting mountaineering activities we offer. Read about the various exotic locations we will take you to. Provides information about who we are, including: our experience; qualifications; safety record; expedition history; client testimonials; and personal profiles of team members. The complete listing of all the courses and holidays (with dates and prices) currently on offer from Go Higher, plus personal instruction and guiding fees, and charges for accommodation at High Dyon Side. Here you will find our booking form and contact details for Go Higher, including: address; phone; fax; email. All you need to know about our home base, High Dyon Side, including a description and photos of the farm, B&B accommodation, maps and directions showing where we are located and how to find us, plus our contact details. Contains a wealth of links to sites of interest with a particular emphasis on outdoor activities. Here you can join our mailing list and receive updates on Go Higher's activities and offerings. What does that word mean? Here you'll find the answers. Here you will find a selection of spectacular imagery taken by staff and clients of Go Higher, representing 25 years of expeditions to many different parts of the world. And here you'll find the stories of our past adventures to accompany the photographs! An express navigation tool, the Site Map is is a navigable schematic diagram of the site. From here, every page is just one click away. If you've any questions, require further information or would like to make a booking, here you'll find all our contact details. This link takes you to the Cumbria Tourist Board's comprehensive GoLakes website, which contains all the information you'll ever need about The Lake District (including: places of interest, accommodation, transport, eating out, events & activities). The important legal guff, which you should read before using this site. Rock climbing the famous Lakes landmark, Nape's Needle, at the turn of the 20th Century. From a glass negative by George and Ashley Abraham (Courtesy of the Fell and Rock Climbing Club). Go Higher makes no representation or warranties, or assumes any liability or responsibility for or as to the accuracy (including errors and omissions) of any information contained herein and expressly disclaims any obligation to update said information. Through your access to, and use of this Website, you accept, without limitation or qualification, the terms and conditions set out in the Copyright and Disclaimer Notice. Chris - please remove this site from your archive. This website was created by Peter Fox on Macintosh computers using Macromedia Dreamweaver, Adobe Graphics & Publishing Suites, and the web expertise of Beaten Track Group Pty Ltd.
News updates on the home page are made possible by the power of Blogger. All material on this website, including text, photos, maps and illustrations are copyright � Go Higher, except where otherwise credited.